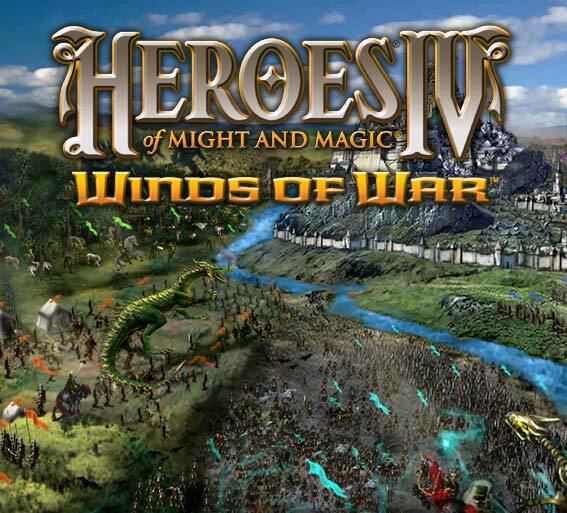 The second expansion pack for Heroes of Might and Magic IV, Winds of War, was made available on the 25th of February, 2003. It does not change the basic elements of the game at all, and is quite similar to its predecessor in terms of content. This was the last game made by the now defunct New World Computing, spearheaded by Jon Van Caneghem himself and Christian Vanover. Another worthy effort by a severely reduced workforce, made more difficult by the faltering status of 3D0. The players assumes a similar role in the Winds of War Campaigns as they did in The Gathering Storm. Instead of a mutual villain, there is a mutual goal among five heroes - to control the kingdom of Channon by capturing its capital city, Rylos. Each Hero has different motives for desiring control of Channon, and hail from 5 different areas, correlated to 5 alignments, Chaos, Death, Might, Nature and Death. Six new Campaigns featured 16 maps between them, telling the tales of five heroes who thirst for the control of the kingdom of Channon. 23 new single player scenario maps, featuring 4 allied maps. An additional 20 maps created by the fans of Heroes of Might and Magic in an NWC-hosted Map Contest held between the months of August - October 2002. Five new Heroes make their appearances in their own Campaign: Mongo the Barbarian (Might), Mysterio the Magnificent the Battle Mage (Order), Erutan Revol the Beastmaster (Nature), Baron von Tarkin the Dark Lord (Death) and Spazz Maticus the Witch King (Chaos). Six new adventure map dwellings are included to facilitate the four new creatures added in The Gathering Storm expansion, in addition to the two more for the Winds of War expansion. There is no Megadragon dwelling. There are three new creatures for your destructive pleasure: the Megadragon, a level 4 Chaos walker, the Catapult, a level 4 Life shooter, and the Frenzied Gnasher, a level 4 Might walker. Three new abilities linked to the Megadragon (Arc Breath Attack) and the Catapult (Siege Capable and Greek Fire). The Campaign Editor has been update to include the 'find object' function, copy and paste of text, and the biggest addition, allowing the mapmaker to make his or her own custom 'brushes' by setting parameters of various types of landscape and adventure map objects to create a distinctive landscape. There is an additional music track provided for the Main Menu to accommodate the theme of the Winds of War.